Round atelectasis is a benign inflammatory condition most frequently observed in patients with asbestos exposure but it can also result from a variety of chronic pleural diseases like infection. It has not previously been described in sarcoidosis. We report the occurrence of round atelectasis in four previously diagnosed sarcoidosis patients who were under follow up at our outpatient clinic. Three patients had symptoms consisting of thoracic pain, dry cough and sensation of fullness at the posterior thorax, respectively. Chest roentgenogram showed subpleural or pleural based opacity with diameters ranging from 2 to 3 cm in each of the patients. Chest computerized tomography (CT) revealed features of round atelectasis. Fiberoptic bronchoscopy with transbronchial lung biopsy was performed. Diagnosis was confirmed by the histopathologic examination of the biopsy samples. The mechanical influence of a prior pleural effusion due to sarcoidosis may be the predominant mechanism underlying the onset of round atelectasis in these patients. Clinicians should bear in mind the possibility of sarcoidosis as an etiologic factor for round atelectasis. L’atelettasia rotonda è una patologia infiammatoria benigna di più frequente riscontro nei pazienti con storia di esposizione all’asbesto, ma può derivare da una serie di patologie pleuriche croniche come le infezioni. Non è stata ad oggi descritta nella sarcoidosi. Viene descritto il reperto di atelettasia rotonda in quattro pazienti con una sarcoidosi già diagnosticataprecedentemente e inclusi nel programma di follow up del nostro ambulatorio. Tre pazienti avevano sintomi che consistevano rispettivamente in: dolore toracico, tosse secca, sensazione di peso nella zona posteriore del torace. La Rx toracemostrava opacità supleuriche o di origine pleurica con diametri compresi tra 2 e 3 cm. in ciascuno dei pazienti. La tomografia assiale computerizzata del torace evidenziava l’aspetto dell’atelettasia rotonda. È stata effettuata una biopsia trans - bronchiale mediante fibrobroncoscopia. La diagnosi è stataconfermata dall’esame istopatologico dei campioni bioptici. La componente meccanica di un precedente versamento pleurico secondario alla sarcoidosi può essere il meccanismo predominante che ne ha causato l’insorgenza in questi pazienti. I clinici dovrebbero perciò considerare anche la sarcidosi come possibile agente eziologico per l’atelettasia rotonda. 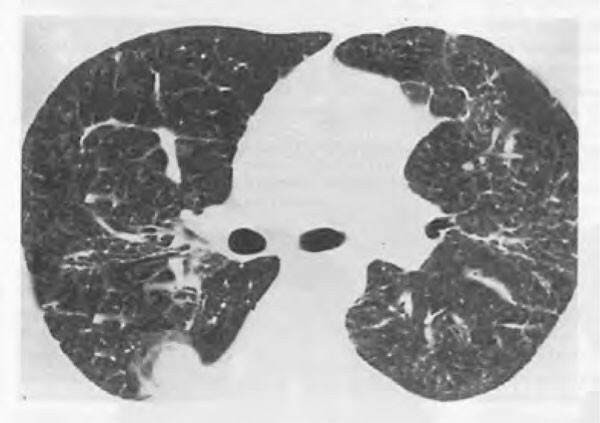 Round atelectasis is a rare lung pseudotumor that is most commonly associated with asbestos-related disease but it may arise from a variety of chronic pleural conditions such as infection, uremia or heart failure and is usually asymptomatic [1, 2]. Although round atelectasis has typical radiological features, it sometimes mimics carcinoma clinically and histologically , posing a diagnostic challenge for the clinician and leading to unnecessary surgical resection. Sarcoidosis has not been described as a potential etiologic factor for round atelectasis before. We present four cases of round atelectasis in sarcoidosis. Our observations suggest that clinicians should consider sarcoidosis in the differential diagnosis of diseases leading to round atelectasis. The four patients were under follow up for previously diagnosed sarcoidosis at our outpatient clinic. All subjects underwent pulmonary function tests, diffusion capacity and arterial blood gases assessment and thoracic computerized tomography (CT) prior to the bronchoscopic procedures. Fiberoptic bronchoscopy, bronchoalveolar lavage (BAL) and transbronchial lung biopsy were performed in each patient. A 38-year old male with a four-year history of sarcoidosis presented with posterior thoracic pain. There was no history of previous occupational or environmental asbestos exposure, infection or pleural disease. He was a smoker (24 pack/years) and did not use any medication. Physical examination was unremarkable. Complete blood count, liver and renal function tests were normal. Chest x-ray showed a right subpleural mass of 3 cm. Pulmonary function tests and arterial blood gases were within normal limits. CT revealed an oval pleural based opacity associated with loss of volume, curving of adjacent pulmonary vessels and bronchi into the edges of the opacity at the level of right lower lobe with bronchovascular and subpleural nodules (Figure 1). Bronchoscopic examination and broncho alveolar lavage cytology were normal with no asbestos bodies and with negative cultures for bacteria, fungus or mycobacteria. Histopathologic examination of the transbronchial lung biopsy samples showed noncaseating granulomas compatible with sarcoidosis. CT image at the level of the right lower lobe bronchus shows an oval mass abutting the pleura, pulmonary vessels curving toward the opacity with parenchymal nodules. An asymptomatic 46-year old male with a two-year history of sarcoidosis presented with dry cough. Personal and family history were negative with no history of previous infection, or asbestos exposure. He was a smoker (32 pack/years) with no use of medication. Physical findings were normal. Hemogram, liver enzymes, serum creatinine and blood urea nitrogen (BUN) were within the reference values. Chest x-ray showed a 2 cm round pleural based opacity. Pulmonary function tests were normal. Arterial blood gases revealed mild hypoxemia (pO2: 76 mm Hg). Chest CT revealed a round mass at the level of the right lower lobe with the characteristic comet tail sign of curving of bronchi and pulmonary vessels into the lesion with bronchovascular and subpleural nodules (Figure 2). Bronchoscopic examination did not reveal any abnormalities. BAL culture was negative for bacteria, fungus or mycobacteria. There were no asbestos bodies in BAL fluid. Cytology of the CT-guided needle aspiration biopsy sample was not diagnostic. Biopsy specimens of the transbronchial lung biopsy revealed nonnecrotizing granulomatous inflammation. Chest CT revealed a round pleural-based mass at the level of the right lower lobe with the characteristic comet tail sign of curving of vessels into the lesion with peribronchovascular and subpleural nodules. A 42-year old male presented with a sensation of fullness at the posterior thorax. He had been under follow up for sarcoidosis for the last five years. There was no history of infection, asbestos exposure or pleural disease. The patient was a smoker (30 pack/years) and did not use any medication. Physical examination was unremarkable. Hemogram and routine biochemical analyses were normal. Chest x-ray showed a 3 cm right lentiform mass with irregular margins. Pulmonary function tests demonstrated a mild obstructive pattern. Arterial blood gas values were within the normal range. CT revealed a peripheral lentiform mass at the level of the right lower lobe abutting the pleura posteriorly with curving of adjacent pulmonary vessels and bronchi into the edges of the opacity. Bronchoscopy was normal. BAL culture was negative for bacteria, fungus or mycobacteria. Asbestos bodies were not detected in the BAL fluid. Histopathologic analysis of the trans-bronchial lung biopsy material displayed nonnecrotizing epitheloid granulomas. A 39-year old asymptomatic male presented with a subpleural lentiform lesion with smooth margins on the chest x-ray during his routine control for sarcoidosis. The patient had no occupational or environmental exposure for asbestosis. There was no history of infection or pleural disease. The patient had had sarcoidosis for 6 years and was a smoker (20 pack/years) with no previous use of medication. Pulmonary examination revealed no abnormalities. Hemogram, liver and renal function tests were within the normal limits. Chest x-ray showed a left irregular mass of 2 cm abutting the pleura posteriorly. Pulmonary function tests and ABG values were in the normal limits. CT revealed a rounded mass adjacent to an area of pleural thickening with a vessel curving into its lateral aspect. Cytologic examination of the CT-guided needle aspiration biopsy was not diagnostic. Bronchoscopic examination was normal. BAL culture was negative for bacterial, fungal or acid-fast organisms. There were no asbestos bodies in the BAL fluid. The trans-bronchial lung biopsy samples showed noncaseating granulomatous inflammation. Round atelectasis is an uncommon benign form of peripheral lung collapse . It is usually associated with asbestos and more rarely infection-related pleural disease [4, 5]. Patients with round atelectasis are predominantly male and are often smokers, with a mean age of 60 years, range 20 to 83 years [1, 6]. They are usually asymptomatic with incidental discovery of a mass on routine chest radiograph. Symptoms include cough, dyspnea, fever, with fatigue or weight loss. Rarely, hemoptysis or chest pain may be present. Although most cases are attributed to asbestos exposure, the other potential etiologies are tuberculosis, uremia, heart failure, and Dressler syndrome and trauma [1, 3, 6, 7]. A specific etiology was not elicited from the clinical history or laboratory investigations of our patients who were all under follow up for previously diagnosed sarcoidosis. Round atelectasis may be the result of the mechanical influence of a pleural effusion on the lung with folding of the parenchyma or a primary localized inflammation of the pleura may become progressively fibrotic and contract, leading to folding of the pleura and collapse of the lung . Transient pleural effusion or a localized pleural inflammation associated with sarcodosis may have led to round atelectasis in our patients as the above theories have suggested. The overall low prevalance of pleural effusion - the predominant mechanism for round atelectasis - in sarcodosis (less than 2%) may be the explanation for the lack of previously reported round atelectasis associated with sarcoidosis in the medical literature. Asymptomatic disease course, spontaneous remission occuring in 85% of the sarcoidosis patients, asymptomatic presentation or the incidental finding of pleural effusion [9, 10] and the probable spontaneous regression of round atelectasis  may be the other factors associated with the underdiagnosis of round atelectasis in sarcodosis. The chest CT in these four cases had typical features but there was no specific etiology to explain the formation of round atelectasis in our patients, e.g. asbestos exposure, chronic pleural disease or infection history. The laboratory or the clinical findings was not compatible with an etiologic cause for round atelectasis either. 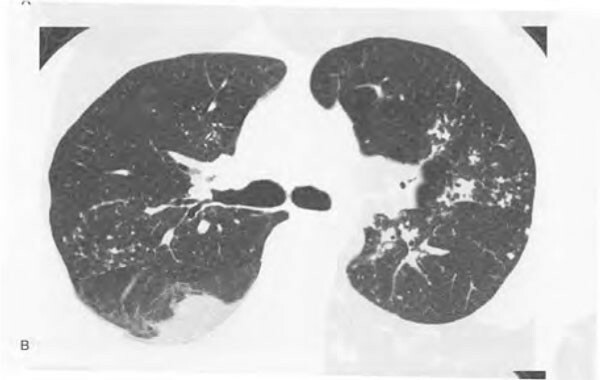 As there are no descriptions of sarcoidosis presenting with round atelectasis in the literature, the patients underwent fiberoptic broncho scopy with transbronchial lung biopsy for the diagnosis of the peripheral lesions. Histopathologic examination of the transbronchial lung biopsy samples were compatible with sarcodosis. There were no complications in our patients during or after the procedure. We conclude that round atelectasis may occur as a result of previous pleural effusion or a primary localized pleural involvement in sarcoidosis. Although chest CT may reveal the typical radiologic features of the lesion, round atelectasis may appear as a diagnostic challenge for the clinician because there are no previous reports of round atelectasis associated with sarcoidosis. Our cases suggest that clinicians should consider sarcoidosis as a potential etiologic factor for round atelectasis. Further studies are needed to define the real incidence of round atelectasis among patients with sarcoidosis because the sample size of our report is small. The safety and the high diagnostic yield of transbronchial lung biopsy establishes this technique as a viable alternative for obtaining adequate tissue samples for round atelectasis due to sarcoidosis.